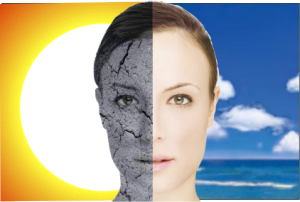 Although most people love the warmth and light of the sun, too much sun exposure can significantly damage human skin. The sun’s heat dries out areas of unprotected skin and depletes the skin’s supply of natural lubricating oils. In addition, the sun’s ultraviolet (UV) radiation can cause burning and long-term changes in the skin’s structure. Dry skin — Sun-exposed skin can gradually lose moisture and essential oils, making it appear dry, flaky and prematurely wrinkled, even in younger people. Sunburn — Sunburn is the common name for the skin injury that appears immediately after the skin is exposed to UV radiation. Mild sunburn causes only painful reddening of the skin, but more severe cases can produce tiny fluid-filled bumps (vesicles) or larger blisters. Actinic keratosis — This is a tiny bump that feels like sandpaper or a small, scaly patch of sun-damaged skin that has a pink, red, yellow or brownish tint. Unlike suntan markings or sunburns, an actinic keratosis does not usually go away unless it is frozen, chemically treated or removed by a doctor. An actinic keratosis develops in areas of skin that have undergone repeated or long-term exposure to the sun’s UV light, and it is a warning sign of increased risk of skin cancer. About 10% to 15% of actinic keratoses eventually change into squamous cell cancers of the skin. Use sunscreen with an SPF of 15 or higher. Sunscreen is one of the keys to radiant, youthful-looking skin. Daily use may even lower your long-term risk of skin cancer. By reducing your daily sun exposure, sunscreen allows your skin time to heal and your immune system the chance to repair some existing damage. Exfoliate. The buildup of stratum corneum (the dead, outermost skin cell layer) can make skin appear blotchy and uneven. Also, remnants of self-tanning products can collect in typically dry areas (such as the elbows), causing the skin to lose its luster and appear “dirty.” Scrubs can remove dead skin cells, leaving skin looking smoother. Bleach the brown spots. Skin lightener does not actually make the skin white; it simply helps to lighten accumulations of unwanted color. Retin-A, and a mild steroid cream, is useful for stubborn brown spots and blotchy brown discoloration. Hydrate. Summer exposure to sun, chlorine, and salt water can dry out your skin – even the heels of your feet can be affected. Try a hand and body cream, and, for the heels, a moisturizing foot cream. A moisturizer with AHA or facial serum with hyaluronic acid can plump up dry skin around the eyes, making skin instantly appear less wrinkled. Continued use may help stimulate the production of new collagen, a protein that helps give skin its texture and appearance. Try a light-emitting diode (LED). Light-emitting diodes (LEDs) are electronic light sources, and some home units are available which can help promote collagen production, reduce fine lines and wrinkles, and improve acne. Laser therapy can improve pigmentation and wrinkles.